The corrosion of machinery and structures leads to a loss of functionality and structural integrity, which can be both dangerous and costly for a company. It is estimated that corrosion costs UK companies around £60 billion in material reparation and new build replacements each year; therefore it is much more cost-effective to have regular paint inspection surveys carried out. Paint Inspection Ltd specialise in providing quality control inspection of the preparation and painting process on behalf of clients, within a number of different industry sectors, including rail, gas and oil, highways, local authority, renewable energy, and marine. We have offices in four different locations throughout the UK: Fareham, Preston, Darlington, and Exeter, so our highly qualified team of paint inspectors are within easy reach of all corners of the country. We work to all recognised industrial standards including ISO, NACE & SSPC; and each member of the Paint Inspection Ltd field team is qualified to a minimum level of ICorr Level 2 and NACE Level 2, and will always be supervised by an ICorr paint inspector and NACE Level 3 inspector. A review of the project specification; which may involve a review of the contractor’s coatings submittals to verify conformance. The creation of an Inspection Test Plan tailored specifically to the project. A full examination of all paintings and coatings is carried out to assess baseline, thickness, corrosion, and fire damage. A detailed report is then produced for the client, highlighting weak points in their coatings and recommendations for improvements. All of our field inspectors are fully qualified to carry out inspections on both ferrous and non-ferrous metals. Our tests include rust grade analysis, blast profile inspection, pull-off tests, and wet film thickness among others, so you can be assured of a thorough paint inspection from our team. Our state-of-the-art online reporting system, IRIS, enables our paint inspection team to potentially remain onsite full time during all periods of active surface preparation or coating application. It also allows our inspectors to accurately document the coatings inspection measurements and any observations they make. The IRIS system helps our clients and project managers to access the quality documentation remotely 24 hours a day. The Institute of Corrosion, aka ICorr, provides a number of courses that enable paint inspectors to acquire the necessary qualifications to carry out inspections in the field. All of our inspectors must achieve a minimum of ICorr paint inspector level 2, and we regularly send our field inspectors on refresher courses to keep up to date with any changes in the industry and legislation. 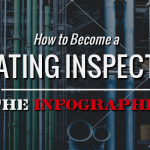 The NACE Coating Inspector Program (CIP) has been setting the standard for inspections in the protective coatings industry for over 30 years. The CIP is an international certification program that produces the highest calibre of paint inspectors and thus helps to save billions of pounds in potentially costly coatings mistakes. All of our field inspectors are qualified to at least CIP Level 2, and our supervisors hold CIP Level 3 qualifications. If there’s anything else you’d like to know about our paint inspection service then please don’t hesitate to contact us. We’re the paint and coatings experts and we’re always happy to answer your questions.